Note: This whiskey was purchased by us for the review. At no point were we given a sample or bottle by Kings County in order to create this review (although we wouldn’t have said no). No matter what, our opinions are always our own, honest, and hopefully helpful to you. Did you know there’s a distillery located in New York City?! Having spent a lot of time in NYC, I wouldn’t think they could have found an adequate spot with enough square footage with reasonable rent to actually start up a distillery. They at least found the square footage in the old paymaster building in the Brooklyn Navy Yard. Kings County touts itself as being the first distillery in New York City following prohibition. In addition, Kings County is the oldest distillery in New York City. Well, doing some quick math… Prohibition ended in New York in 1933… Kings County Distillery opened in 2010… That means that New York City’s oldest distillery is only 7 years old! It also means that New York City didn’t have a distillery in 77 years! 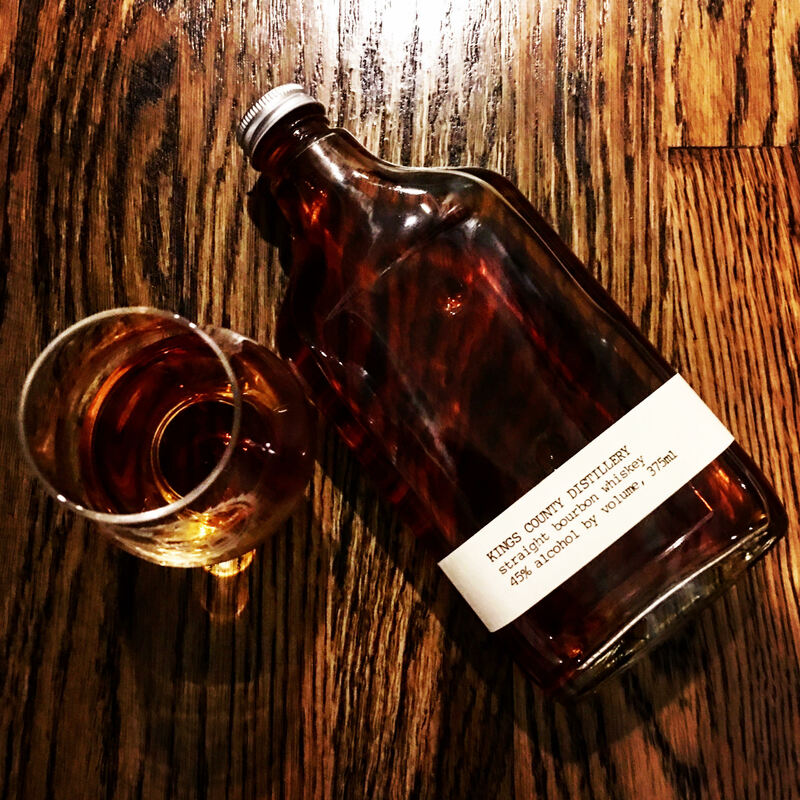 Kings County has a few different offerings and, although I’ve heard great things about their Chocolate Whiskey, I was able to get my hands on their Straight Bourbon Whiskey. Although this one is non-age stated, there are a few things we can infer on it because it’s a straight whiskey. All I know is that if you are charging at least $40 for 375ml, you better be bringing me fire in a bottle. Nose: This one had a young and astringent smell with a hint of vanilla and caramel. I really had to take a deep sniff in order to get any of the flavor as it was hidden behind the youth. Taste: For 90 proof, I hardly got a burn to know it was there. The taste was about on par with the nose as it tasted very young. However, I would agree with their assessment that it was very sweet with hints of vanilla and cinnamon hidden behind its youth. I did not get any molasses in this one. This one lacked complexity. Finish: The finish was short and there was hardly anything left to know it had been there. Final Verdict: Maybe I’m being overly harsh, but for $40 for a 375ml, I’d like to think that this would have packed a little more punch. Maybe that extra cost is due to the high rent in NYC, but this one seems inflated like the price of bourbon is in most liquor stores in the Five Burroughs. I’d take it if you gave it to me, but I would definitely not purchase this one again. This is surprising to even me, because I’m the one that is overly sensitive to craft distilleries and the taste of youth that can sometimes accompany them, but the price is a complete turn off to me. If you are going to charge that much for bourbon, you at least need to give something in the taste or nose that I can get behind. As much as I tried, I cannot get behind this one. I had such high hopes because I really like the packaging and the simple glass pint glass with a simple label. This is the type of whiskey that looks really cool on your shelf, but doesn’t have much use besides that. I really wish this one had more because I wanted to like it, but ultimately there are too many other things out there for $40 that you should spend your money on.